At the beginning of the 1930's Germany gradually recovered after the protracted economic depression caused by the aftermath of WWI and the stormy political events of the Twenties. The rise of Adolf Hitler, who set out the goal of renewing the political role and importance of Germany, which it had had before the Great War, became the spur for a rapid growth in diverse sectors of industry, including the automobile industry. However, Germany, although the motherland of the automobile as such, had allowed other countries to take up the leadership of the motor industry during the early years of the 20th Century; first of all France and England, and these countries had become the trendsetters in motor vehicle development. In the middle of the Thirties the renowned designer Ferdinand Porsche proposed the concept of a "folk car" to Hitler. He developed a small automobile, which then became one of the classics of the motor industry, the VW Beetle. The elegant contours of this car inspired a real boom among German auto designers. Cars of previous years had a body of distinct and separate forms, amongst which were distinguished a hood, rear body, boot, etc. Now a preference was given to the construction of cutting edge aerodynamic forms, and soon these new features were widespread not only on automobiles but also on trucks, buses and even passenger-trains. The small truck body workshop of Ludewig Brothers in the German city of Essen had been installing bodies of their own design on the chassis base of trucks from the leading German motor manufacturers for some years. 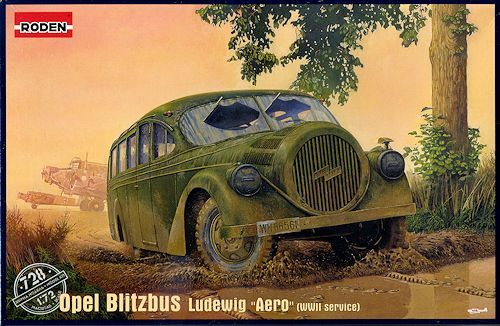 In the 1930's the Ludewig firm cooperated especially closely with the Opel business concern. After the appearance of the Opel Blitz three ton truck the Ludewig Brothers workshop developed a few new conceptual bodies for this vehicle. One of them was a bus of incredibly stylish exterior with an oval front end treatment, and finishing off with an aerodynamic fin behind. This unusual bus did not only have a futuristic exterior. Passengers were situated inside on luxurious chairs more like what you would find in a hotel with a section in the rear of plush couch-like bench seats. Like the earlier aero bus, the forward seats were positioned at an angle of 45 degrees to the windows. It was considered that buses of this type would carry out excursion trips, and passengers would benefit from an excellent view out of the bus through the large panoramic side and overhead windows. In the middle 1930's the truck body workshop of Ludewig Brothers constructed a small production batch of these vehicles. Even for that time their production was expensive, and that is why the workshop did not receive large orders for them. These machines were widely used for propaganda motor races on the newly built autobahns. A few were delivered to ODI, a transport firm, for intercity travel. Apart from civilian service, buses of this type were taken over for military purposes. At least one of these was used by the German Army, mostly used to transport higher ranking officers. Its civilian paint scheme replaced with a more drab grey. This is basically a repeat of an earlier kit but with different decals. The quality of the moldings is quite good and with careful building will make a most impressive display. The kit has a full engine as well as a complete and separate frame and suspension along with a full exhaust system. The tires and wheels are a single molding with well defined wheel/tire separation. Once the frame and suspension is completed, then the body can be built up and added to it. The body has a separate upper section and side panels to which is attached the rear part and the fin. Despite having a full engine, there is not any separate hood. The engine will, however, be quite visible from the underside of the bus. A sheet of pre-printed acetate is provided for the interior windows. 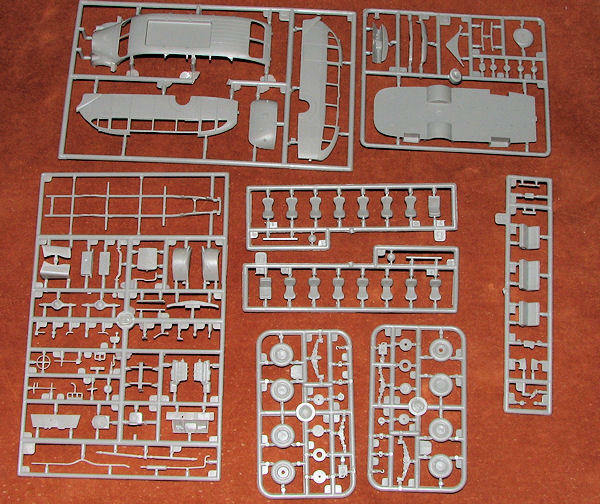 The decals consist of license plates for two vehicles that were repainted in panzer grey.The painting instructions on the back of the box show two vehicles that differ only in the plates. Instructions are well drawn leaving no doubt as to what goes where. These are very cool kits and the perfect scale for a bus as these tend to be rather large. If you are tired of the usual, this one will make a very nice break from the norm and look quite pleasing on your display shelf.